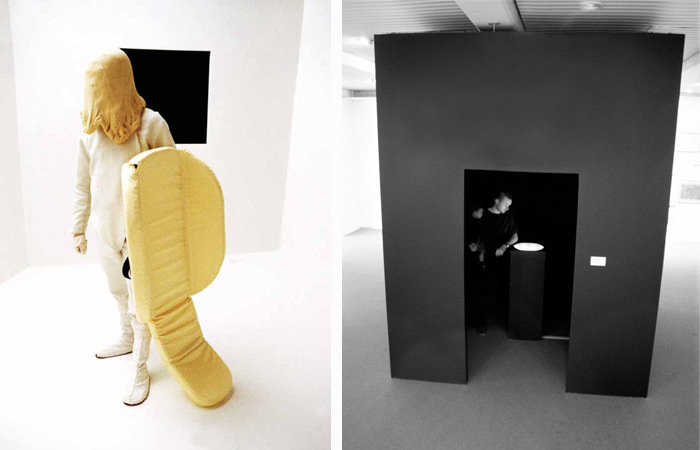 Stills: Video installation ARoS Museum of Art Denmark 2001 & Becks Futures Prize at ICA London 2001. Producer: Kevin Bendix & Søren Dahlgaard. Actors: Mikkel Bender and Mikkel Tjellesen. Dough throwers: Klaus Ammitzbøll and Henrik Menné. Text from the group show TAKE:OFF at ARoS museum of Art, Denmark 2001 by curator Anders Kold. 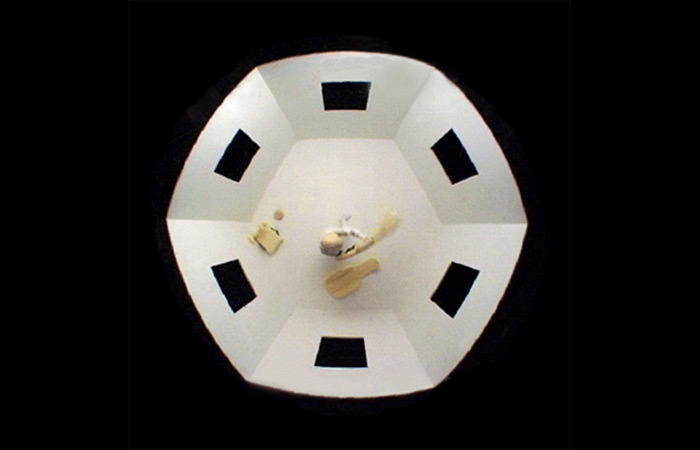 Søren Dahlgaard’s video, Hexagonal Cyclops, takes its mark in surreal figments of the imagination about the hexagon as building structure – the panopticon – which is organized in such a way so that from one certain spot, a person can get an overview of the entire building. In the video, Dahlgaard has been inspired by Jeremy Bentham. In 1791, this English philosopher devised the ultimate disciplinary surveillance architecture, namely the panopticon as a jail. The prisoners could be monitored all the time without their even knowing when and from where they were being watched. The prison personnel would be invisible to the prisoners who would be compelled to behave properly in light of the mere thought that they were always being watched. They could never crawl into hiding and never do anything private. They could be seen, but they themselves couldn’t see. In Hexagonal Cyclops we look down into the panopticon from a bird’s eye view. 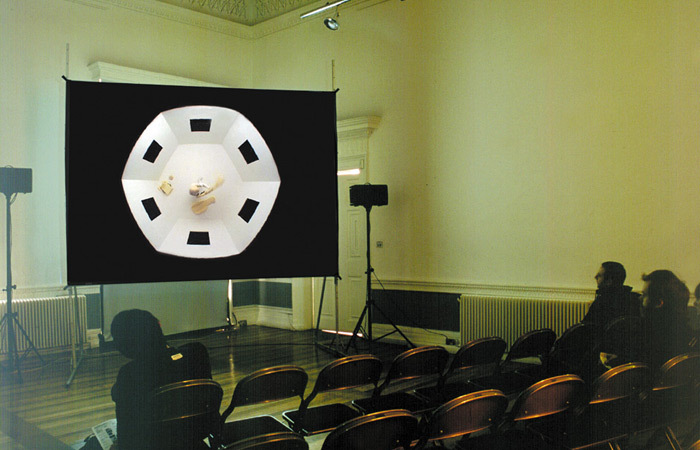 The video projection assumes the form of a box that you have to look down into. What arises here then is the illusion that the panopticon is somewhere down inside the box. 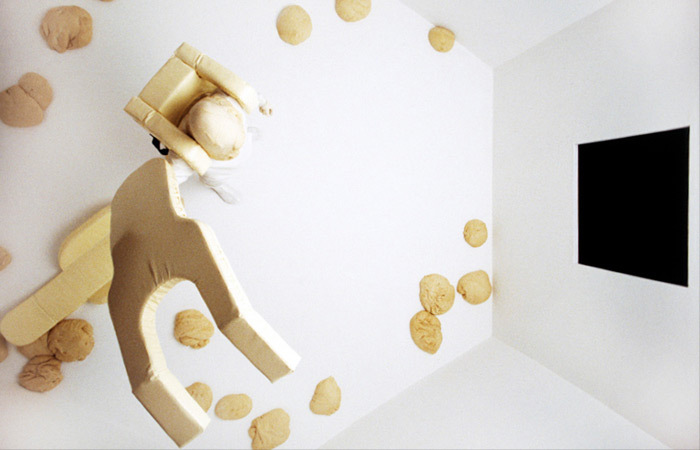 Inside ‘the box’ there is a man, who is suddenly being fired upon with large flying clumps of dough from all sides. He is clad is a white fencing suit, and he has too much dough on his head that he cannot see anything at all. He tries to protect himself with a couple of hopeless foam rubber implements. He parries, stumbles and gets up again, parrying. But being fired upon from every which way, he hasn’t got a chance. The video leaps in time so that we get no clear sense of any distinct narrative structure. There is no beginning, no climax, and no ending. We are spectators, looking at a peculiar space with a peculiar story that could supposedly only take place in surreal dreams. We are already cast in the role of the spectator from the moment we redeem our ticket to the museum and this now becomes overdubbed with the fact that we stand and gaze down into a panopticon-like another one of the prison guards. The museum-defined relationship between viewer and work is further intensified by Søren Dahlgaard’s dough-Cyclops, which we can keep an eye on with a certain sadistic delight. Alfred Hitchcock’s psychological thrillers, where nothing is ever what it appears to be, have also played a role for Søren Dahlgaard’s video. What Hitchcock and Dahlgaard have in common is a search for the subconscious layers in the nightmare-like scenes. But with Dahlgaard’s rubber-clad man it all takes an ingenious turn that is difficult to grasp. What is it that I’m looking at, and why am I looking so intensely? That which we might be running into this sensation is a very literal description of an inquiring art observer’s role, a most concrete rendering of the viewer … seen with a slightly morbid smile on the lips. 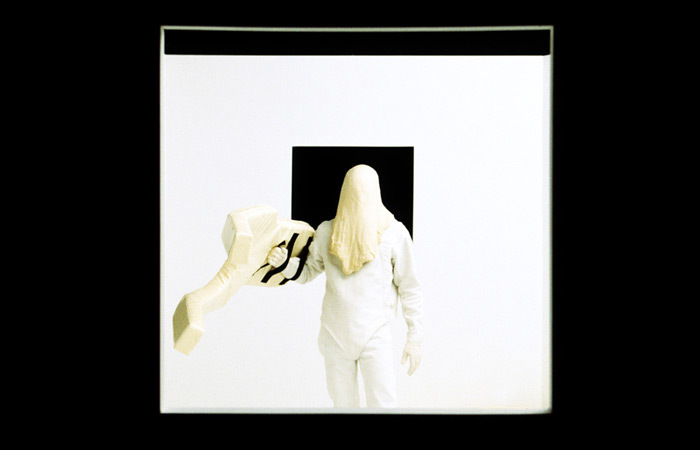 Anders Kold: In Hexagonal Cyclops, your new video installation, a solitary male figure is being assaulted from all sides by clumps of dough, which rush in through apertures in the wall of the narrow room. And, like mythology’s centaurs, the figure shields himself heroically against the sticky substance. There is no conclusion built into the work. We are being presented with nothing more than this phase. What does it all mean? Søren Dahlgaard: From my side, there is no simple interpretation in one sentence or two about what you are seeing. The work is relatively open to analysis and people see a lot of different things in it: computer games and surveillance films, among other things. It’s not about any genuine place. It could be about every place. To me, what is interesting is that you don’t really know whether he is there as a captive and feels anxiety and like he is being spied on or whether this is all a game or a kind of play. In this way, it’s got a lot to do with his relation to the windows. He’s being blinded by the dough and the holes are filled with blackness. He’s consequently being exposed to the panopticon, where he can be seen, but cannot see anything himself. He gets up and he stands and he waits and that suspense is crucial. Reality and unreality, in a Hitchcockian sense, is absolutely part of this. What are we to believe, as is asked in the beginning.